Throughout the year, Donington Park hosts countless automotive events with all sorts of automotive perfection rolling through its gates. Hosting a show at such an iconic venue, on the same weekend as the British GP doesn’t sound like a great idea. The event’s success and growth over the past three years however is testament to just how great this show is. VAG Tuner Live, back for its fourth year is now arguably one of the UK’s biggest performance focussed VAG shows. We rocked up again this year, ready for another exciting weekend at the historical circuit to showcase Revo products, and more importantly, demonstrate their capability on track. With a bustling stand throughout the day, the team were in their element catching up with customers and talking through their build plans and offering advice. The Reflex Auto Designs 997 slant nose got some well deserved attention. Sat amongst some of its German cousins including the Revo S3, new TTRS and Golf R along with Andy Stephenson’s Golf R, both running 500HP courtesy of the Revo Performance and Power Package. Many people also took advantage of a free passenger lap in one of the Revo development fleet vehicles to experience just what is capable with Revo products. What better way to show the quality of Revo products than by thrashing them on track, all day in +30ºC temperatures? Eagerly waiting to experience the Revo A3 Track car at Donington. A testament to the reliability of a Revo tuned car, the Revo A3 Track car is now 13 years old and was the work horse of the event. Running over 400HP the car was subjected to over 60 laps throughout the day, and although it needed to be parked up once or twice (so driver Kev Brown could cool off), it was begging for more. Cooling down the Revo TTRS cabin after some very hot laps. Dave from ADS focussed on the task ahead; hammering his GTI Clubsport around Donington. Revo Authorised Dealer TTRS Roadsport and their mk5 track car ready for a long day on track. We have a clear tuning ethos at Revo, that’s why our products do what they promise, consistently. 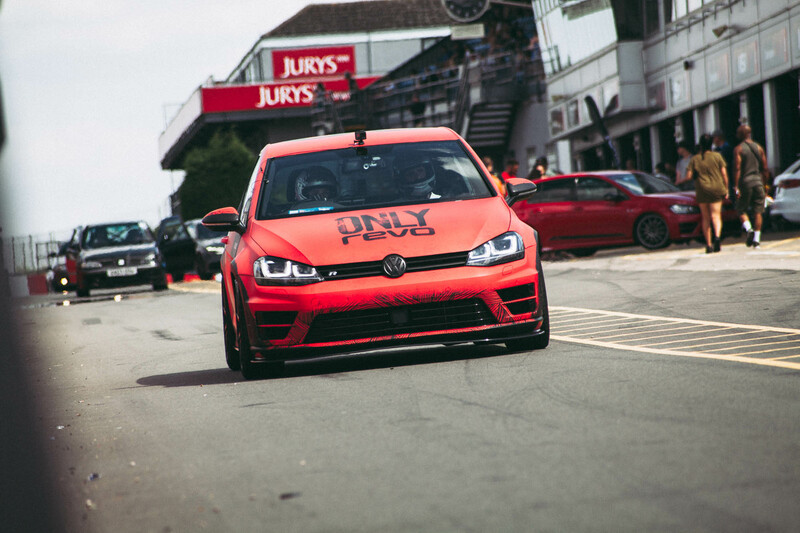 We didn’t want you to miss out on the action, so we strapped our Technical Development Manager Kev Hall in to the Revo 500HP Golf R and sent him out on track to talk through our ethos, and the soon to be released Performance and Power pack for the MQB platform. There will also be a full 360º VR version coming soon, so you can go out in the Golf R yourself. Stay tuned! We were lucky enough to also have both the Revo TTRS and Golf R on the front covers of VWG Magazine and Performance Audi Magazine, great magazines with all the latest news and products from the after-market automotive industry! Get your hands on a copy by clicking the links above. 17 year old racing driver Shanel Drewe also gave the Golf R some stick around the circuit. 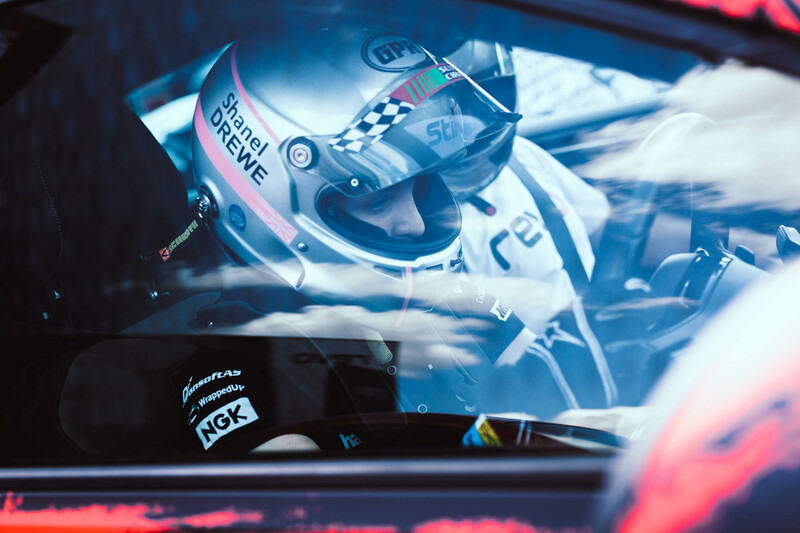 We had the pleasure of catching up with racing driver Shanel Drewe. 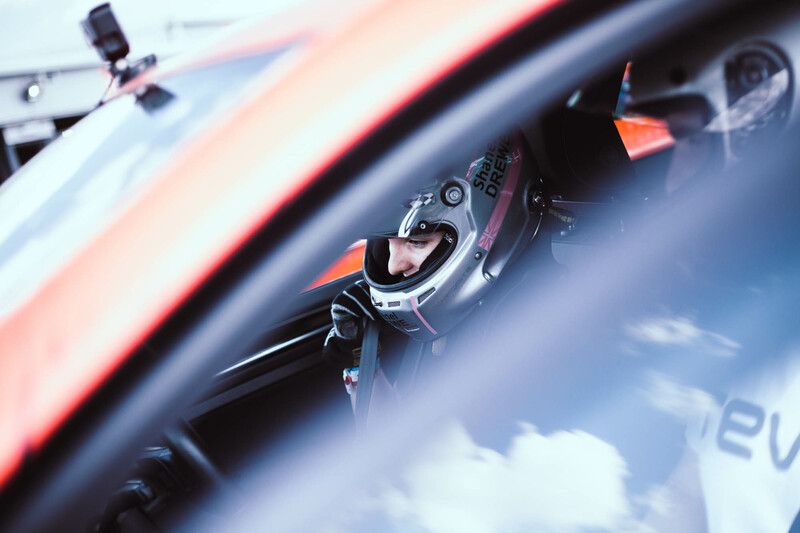 The 17 year old who had her debut season in the Junior Saloon Car Championship just a few years back has quickly become renowned for her raw talent and passion for racing. 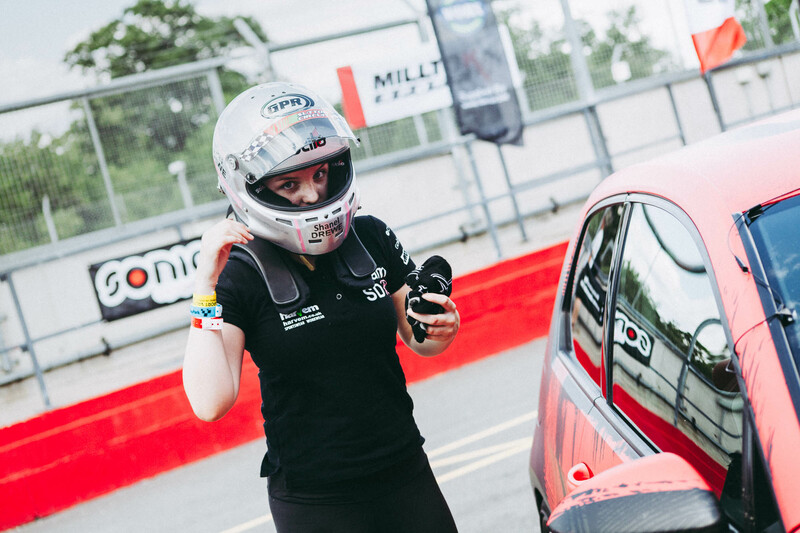 Now taking her first step up in to the British Automobile Racing Club’s Road Series, she’ll be the youngest driver on the grid but don’t let that cloud your judgement. She’s currently Michelin Clio Cup Vice Champion 2017 and was even awarded Young Sports Personality Of The Year 2017. More at home in her pink liveried Clio, we thought we’d give her the keys to our 500HP Golf R to let her give it some stick around Donington, a track she has already proven she’s more than capable of handling. I took the Championship to the last corner of the last race, and along the way equalled the Championship record for the most podiums in a season, completed the most overtakes of anybody, was the only driver to finish every race and became vice Champion of the Michelin Clio Championship (Road Class), despite being up against much more experienced, and older drivers, and with perhaps the least budget of anybody on the grid. If you took any photographs from the day then remember to share them with us. We love to see what you get up to at events, all you have to do is use #onlythedriven or #onlyrevo, and if you’re lucky you might even get a share! A big thank you to those who helped us take customers out on track, and the amazing network of Revo Authorised Dealers that were representing us at the event. Until next year!